Prof. Paddy Barry of University College Cork gave the weekly WIT maths/physics seminar today, entitled ‘School Geometry in Modern Times’. During the seminar, Prof Barry touched on that familiar theme, the loss and eventual recovery of Greek maths and science. It was interesting to hear this story from the perspective of maths rather than science. Euclid’s Elements date from about 300BC, and the productive period of Greek geometry lasted until about 400 AD. Following the collapse of the Roman empire, Europe lapsed into the Dark Ages, throughout which learning and scholarship were minimal. Thanks to the conservation of classical scholarship by Islamic scholars, a gradual recovery began in Europe about 1000 AD, culminating in the Renaissance in the 15th and 16th centuries (all this is of course true for Greek science as well as maths). 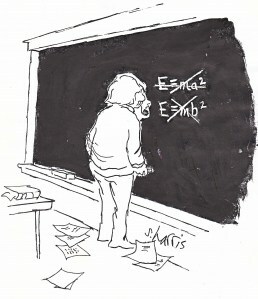 And what of Greek maths? Euclidean geometry was at first embraced throughout Europe. Around the 1500s, reformists such as Petrus Ramus got to work in France, and the French approach to geometry was followed in most continental European countries. However, England was more conservative. Thanks to Oxford and Cambridge, Euclid’s Elements remained the dominant treatment until 1903. There followed then an adaptation of the Elements, exemplified in A School Geometry by Hall and Stevens. .. So, given the different treament of Greek maths and science, it could be said that in England at least, there was a decisive split between maths and science right from the time of Galileo! I can’t help wondering if this split might why English science played quite a small role in the early 20th century revolutions in theoretical physics – there’s no question that quantum theory (QT) and general relativity (GR) were dominated by German-speaking countries in the early years. I guess it’s a coincidence as GR invoves curvilinear geometry, and QT involves none at all..
Well, all radical ideas meet objections. A new scientific theory doesn’t make progress by overcoming objections with sheer force or counter-arrogance, but by becoming clearer, more lucid, and therefore better understood. Euclid is commonly dismissed for neglecting the possibility that spacetime is curved. However, according to quantum gravity, the effects of curvature are attributed to a spacetime fabric composed of graviton interactions. Already we know that two confidence-tricks must be used to make the continuously variable differential geometry of general relativity (Ricci tensor, its trace, and the stress-energy tensor) approximate the real world. Instead of representing the particulate distribution of matter realistically in the stress-energy tensor, you always have to put in an artificially smoothed (averaged) distribution which ignores the discontinuities of fundamental particles at discrete locations in the vacuum. So you have to model mass-energy (the source of the curvature) using a false model such as a “perfect fluid” in which density is averaged, rather than being lumpy. You can’t use calculus on discontinuities, or you get infinities and zeros as output. E.g., true density is zero up to the edge of a fundamental particle, say the Planck scale or whatever radius you use, then density jumps discontinuously to a very high value. The rate of change of density is thus zero or infinity. So to get the stress-energy tensor to work smoothly, you have to put in an artificial, averaged distribution of fundamental particles instead of using the really discontinuous distribution of small fundamental particles in the vacuum. Then when you calculate curvature, you are again using a tensor, differential geometry. But curvature is not real because spacetime is quantized with discrete, quantum graviton interactions causing all the effects. Hence, masses accelerate in discrete impulses due to successive graviton interactions, not as the smooth acceleration suggested by 3+1 dimensional curved spacetime in classical general relativity. All of the curvature effects of general relativity can be better understood in terms of graviton interactions than in terms of classical 3+1 dimensional spacetime curvature. E.g., the normal way to present curvature of 3 dimensions in space is to draw a 2 dimensional diagram. As soon as you extend the 2 dimensional diagram to 3 dimensions, you end up facing the reality of the spacetime fabric, not geometry. Aristotle’s “Physics” made it clear that he didn’t understand what air is. He believed that when an arrow is fired, it continues to move because air is displaced by bthe motion of the arrow from its front, and then pushes around the moving arrow from front to rear, pressing in at the back of the arrow, thereby keeping the arrow in motion. What he was trying to do was to explain the physical mechanism behind Newton’s 1st law of motion (not yet formulated experimentally in Aristotle’s time), the momentum of a moving object. If Aristotle had known about the spacetime fabric (as distinct from air) and fundamental particles, he could have applied his mechanism for momentum to the spacetime fabric flowing around moving fundamental particles from front to rear. This mechanism is vital for physics. Gauge bosons which interact with fundamental particles can’t penetrate through those particles as if those particles were not there, or they wouldn’t have any interactions or any effects. Hence, gauge bosons like gravitons are stopped by the fundamental particles they interact with. Consequently, when a fundamental particle such as some fermion moves, it might be expected to create a void in the spacetime fabric behind it, and for the spacetime fabric to pile up on the moving side. But because the spacetime fabric such as gravitons is composed of light-velocity exchange radiation in perpectual motion, the spacetime fabric is capable of moving out of the way of moving fundamental particles if those particles aren’t going at light velocity themselves. Hence, the Aristotle mechanism really does seem to reply. Also, the pressure of gravitons against moving matter in the direction of motion can be shown to cause the FitzGerald length contraction and mass increase effect. I’m not sure that’s true – I think Eucliden geometry formed the basis of much of mathemetics for millenia, and still does. The fact that alternate geometries, and other areas of mathematics have since emerged, don’t diminish Euclidean geometry, and that’s the point.